The feeling of finishing a marathon is unlike any other. The last three miles are always a blur. You feel more fatigued than you ever have felt before, even though for me this was round 5 at marathoning, but surely this time felt way harder. Every step hurts everywhere and the desire to slow down or stop grows and grows, along with the desire to cry (weird, right? ), though the thought of crossing the finish line, getting a medal, and seeing the smiling faces of my mom and boyfriend kept me going. When you finally cross the finish line, the feeling of exhaustion takes over, many times I have gotten my medal and food and sat right on the ground in the middle of everybody’s way. At the same time you feel accomplishment, relief, and happiness—all you want to do is cry, for no reason. These emotions and the 5 seconds leading up to the finish are what keeps me running marathons. There is no other thing in life that can include such a multitude of feelings, physical and emotional. I was a few minutes away from finishing when I saw an ambulance or two go by, and my first reaction was that it was kind of normal. I made a note in my head that maybe somebody collapsed by the finish line—as I’ve seen that quite a few times in races. As I pushed along through the pain, I just kept telling myself that mom and Nick were waiting and to just put my head down and forget everything and just run. I sensed more and more people slowing down, stopping, some ambulances, and even people kneeling on the ground. I started to think to myself it was super respectful of people to stop for somebody who went down, and maybe it must be worse than what I had seen in previous races. Regardless I thought, this is my race, I trained and I’m going to finish strong. In the last minute of my incomplete marathon, I was still so confused and even noticed people kneeling, like they do in a basketball game if a player is injured. Even though all of these things were going on around me, I was still completely unaware of what had happened at the finish line until a spectator came onto the course and told me I had to stop running. I looked at her and kept going until I noticed people crying and hugging. I finally stopped because I could see police officers blocking the road. At the same time that I heard what was happening and the terrible images going through my head, I could see other people going through the exact same panic. All I could think about was how Nick was at the finish line and my mom is a photographer, so she is always up in the action of everything. The thought of two very important people being dead because they came to support me, and not having a phone to contact them, was probably the worst feeling I have ever felt in my entire life. Although we did meet and everybody I know is OK, the thought that something so important to you can be taken away in an instant is unsettling. So many people had the same sinking feeling in their stomach when they heard the news, and everybody has a story of how they or somebody they know COULD have been right there, or was about to go or was just leaving. The thought that somebody could really decide they wanted to ruin such an important moment in thousands of people’s lives and hearts just amazes me. I hope justice is served, and I know I’ll never get back my 2013 Boston Marathon, but it has also shown me how quickly our first responders jump into action, how fast our law enforcement and security systems know what to do to ensure safety, and how incredibly kind the people of Boston are. I have felt so much support since the bombing, and received multiple pats on the back, hugs, hand shakes, and what have you for being there and being strong. 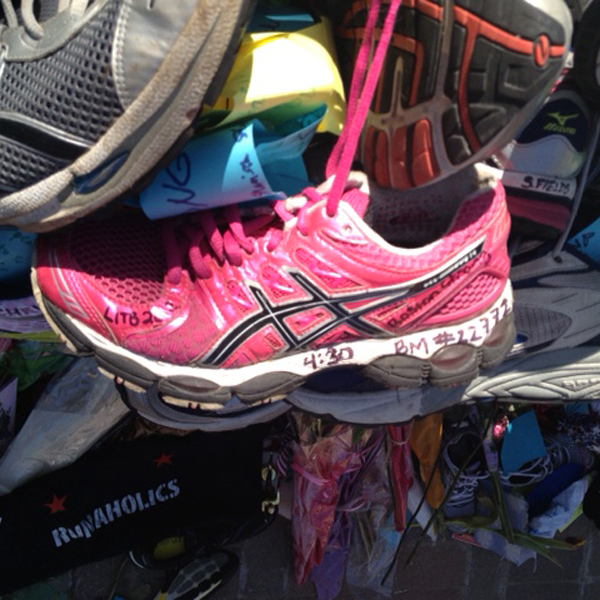 I will take this to my next marathon, which I will finish, and I will always have in my heart Boston Strong.